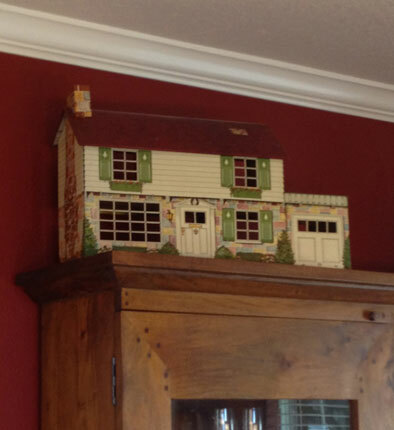 I've been posting all of my crazy sketches and I'll be back to that soon, as I've done several major ones, but today as I was dusting and cleaning around the house I looked up and saw my dollhouse! It is metal and comes apart in about 10 pieces and stores flat. Each room is decorated, so there's no guessing and no changing your mind, as we move through the rooms you'll see what I mean, there's even utensils hanging in the kitchen. Just like the my table and chairs that I featured on here several months ago, this is one more thing my mom kept for me. 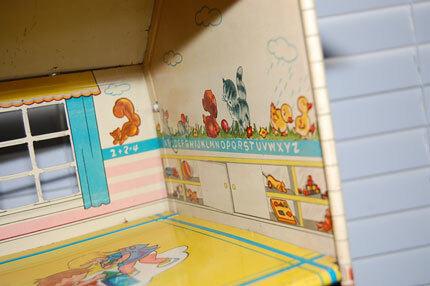 Because it was flat and wrapped in cardboard and plastic it has remained in amazingly good shape. 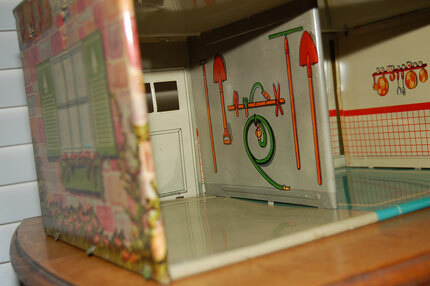 I was putting it together to snap some shots for Etsy and thought why not up on my china cabinet. Looks kind of cute I think and is such a sweet memory. It can always go to Etsy and another home when we tire of it. So let's travel through the rooms. I had lots of furniture, but that has all gone by the wayside. 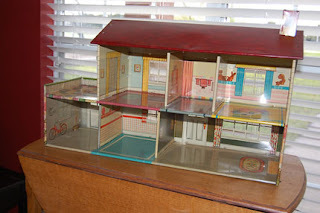 My dad built dollhouses for a number of years and so most of it was used by him, some given away and some just simply discarded, but the rooms came with lots of decorations. Let's look at the inside of the front door and the rest of the living room. I love that there's drapes, rugs, books on the shelves and pictures on the walls. Ready for the furniture and the people! 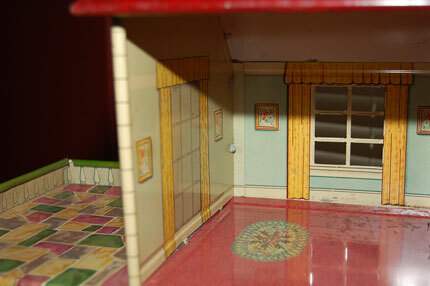 Also, on the lower level you found the garage and the kitchen. The picture on the left shows he left side of the garage and the kitchen wall and the one on the right side of each. I love the bike and the "lawn mower" and dishes in the one pix and the garden tools and utensils in the other! Like I said these houses were ready! The funny part is I have no recollection of the dolls. I remember the furniture, but not the people. If anyone remembers what we used for people, please let me know. Anyway, let's proceed with the home tour. 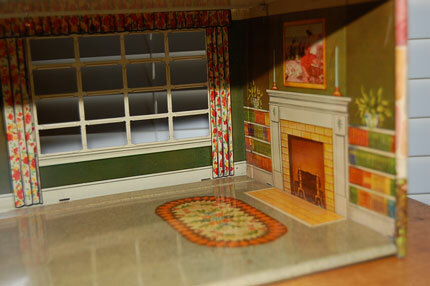 As you can see already, this is not a big home - very modest even in the early 50's. Actually not unlike the home I grew up in. And so we move upstairs to the master bedroom, bath and child's room. There is I might note, a very nice patio off the master bedroom, but the bath, well, there's only one - no suite in this house!!!!! Note, the patio off the french doors in the master bedroom. Nice touch and use of the space above the garage. Next, is that not so big bathroom next door and you notice we had to provide all of the essentials, like the bathtub, sink and toilet. 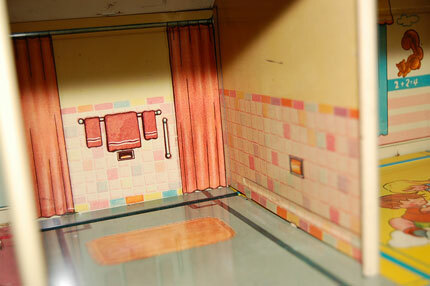 I remember that we had a variety of styles we could choose from and of course the towels came with the house! There was also a built in medicine cabinet on the opposite wall, I just didn't' include photos of everything! Almost, but not quite. And then this adorable child's room. With the cute wallpaper and toys on the shelves. 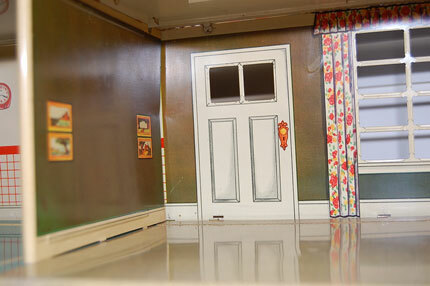 But the one most peculiar part is that the room came with a little girl and boy playing on the floor! I always thought that was so odd, after all the other rooms didn't come with people, but this one did! 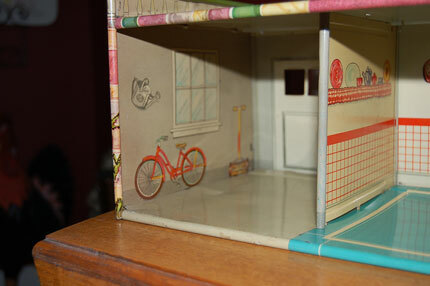 And this final shot is the back, always open so you could decorate etc. The more I think about this house, it's really quite cute, but strange. How did we play this? I guess it was mostly just a decorating and play house kind of toy. Oh well, now it's a decorative item in my home and someday it will be passed on to someone, someway, for something! It's already around 60 years old!!!! What? And I said it was mine! My goodness, it's a wonder it has survived and that I remember playing with it at all! Thanks for traveling down memory lane with me today. I'll be back soon with some of my funny new sketching techniques. 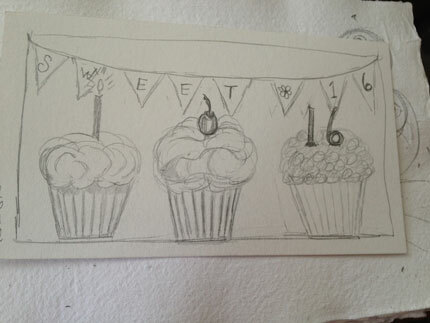 My last post was of my first radish sketches and my cupcakes, yet to be colored. Well, I'm back and I've been busy sketching and coloring and paper piecing (a first for me) and generally having fun. I'm still on last weeks classes so it's a good thing we can work on this at our own pace. This was a busy week for me, spring break was over and it was back to business, Bible study Tuesday and Thursday morning, Sealy Christian Pantry Board meeting Wednesday afternoon, City Council meeting Wednesday night and Property Owners Association Meeting last night and I still squeezed in a little bit of sketching and painting as I found time. So here are my painted cupcakes. I ended my last post with a picture of the sketch. 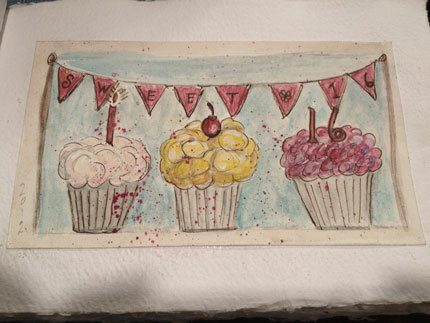 I did this on watercolor paper and then put it in my art journal. I did get it colored later that night, but just didn't get around to taking pictures and posting it until now. 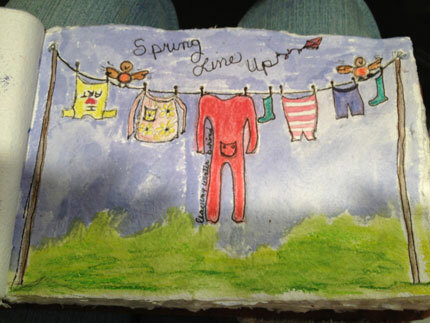 The next thing in our class was called "Spring Line Up" and was a clothes line filled with clothes or what ever we wanted. The first one I did I painted the clothes, then I watched the second video and found out we were paper piecing the items on the line. You make a simple sketch in your sketch book and then draw it on heavier paper in your art journal and paper piece the items. I have so many paper scraps that it was easy for me to find paper to match my clean clothes! I grew up with a clothes line and so this really took me back to some good and not so good memories. We lived just south of St. Louis and in the summer it was fine to hang clothes out, but come winter - well, they froze! We were very fortunate to have a basement and mom could hang clothes in there in the winter, but still cold and not much fun. I journaled a little bit on it, but when I realized I hadn't done it correctly, I just stopped and started over. So here's the second one - with the paper piecing. This one had some wind blowing and I added a nest for one of the birds, a cat and some bluebonnets and some journaling. The red long johns represented the end of winter and I would like to have a dress like on the end - will be watching for that as I head into spring and summer shopping. The point of the exercise is to have fun and I did, but I'm still not comfortable with splashing paint and stamping willy nilly on the front of my work, but the class is called "The Art of Wild Abandonment" so I guess I just need to continue to let go of the thoughts of perfection! Following this I haven't painted another thing, but I've done lots of simple sketching. I did this one of my work table! I'm actually surrounded with stuff with about a foot of work space and this showed it quite well. This is on plain paper, so I probably won't redraw it in my journal and paint it, but you never know. 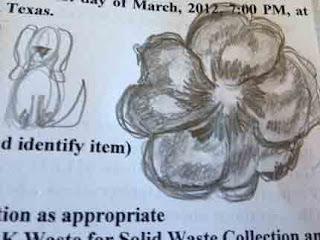 The rest of my pictures are simple sketches I did during some meetings on the back of the handouts or in my study book. I said several months ago when I posted some of my sketches, long before this class that I draw on anything that stays still! I still do, the difference with this class is that I'm learning to use sketching as a form of journaling (haven't really learned that yet) and also, to paint the sketches. Up until now I mostly just sketched to be sketching! Just like these little pictures here. I did practice on my owls and another little clothes line, but mostly just scribbles with one painted with a highlighter! Not exactly fine art!!!!! Note, I reverted back to my flowers, my go to comfort sketch and what about that sheep? You did know it was a sheep, right? Actually it kind of reminds me of Lassie with a way too curly perm! So, now I head back to class! This week we do some dogs and some cats. That's the only thing I know as I couldn't look ahead and complete what I needed to complete. So later tonight I start looking at this weeks daily videos - See you in a few days with my newest sketches. First Class! 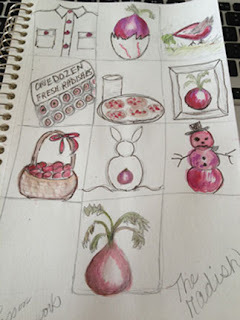 A Study in Radishes . . . . I told you about the new class I'm taking yesterday and today I got started. I was sooo excited when I got the email with my login information - I was official and could get started. That's what I love about online classes - you're not limited to their time of day or even the day of the week. This class actually started on the 12th and here I am lagging behind just starting on the 16th, but that's ok. The first class focused on a radish! Yes, you heard me a radish. First Junelle showed us how to draw a grid to do thumbnail sketches and we got started with radishes. I didn't actually have any on hand and didn't want to wait one more moment, so I used hers. After all she had a bowl full and only used a few of them, so I borrowed a few for my own sketches. Actually, I just made up what I think they look like and I'm happy so good for me. The class is soooo much fun! I followed along with her and tried to copy what she did for the first twelve sketches and then it was my turn on my own and I found my imagination isn't that great! 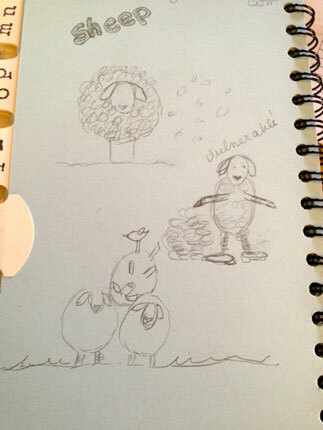 Our homework was to draw at least 10 radish sketches, using them in ways that they would not normally be used! I especially like my radish chip cookies, with milk, of course. These are my sketches, but you must go to see Sally's radishes on her blog! What an imagination - love that girl! I was glad I hadn't looked at hers yesterday or I would have been soooo tempted to copy them and then exclaim, "We are so on the same page!" Ha ha - like she would have let me get by with that! So, we get to see as we do this course together, just how much alike we are and how different - what fun! but must get on with life today and work on this later tonight - so no coloring yet! Check back tomorrow to see the watercoloring added, or maybe even later tonight. You know what you're like when you find something you love to do? Can't stop doing it, well, that's where I am. Can't wait for dinner to be over so I can dig back in to the paints. This one makes me want a cupcake, but looking at the radishes makes me want a cupcake, too! Sounds like a food issue to me. So hard to stop, but away I go. See you later in living color. The art of Wild Abandonment! What an exciting day! I have found two of the most fun, exciting blogs to follow and an online class including both of these talented women. 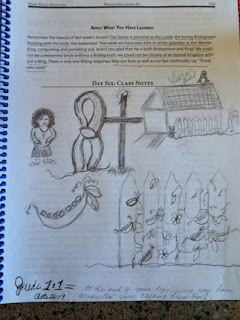 I found the class when my dear friend Sally Keller posted that she was taking a class on sketching and it included sheep! 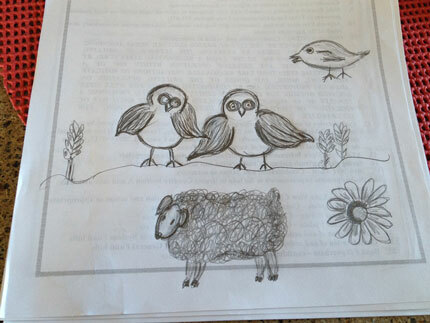 Sally and I both love sheep and I love to draw and paint, so I checked out the link and immediately knew this was a class for me. 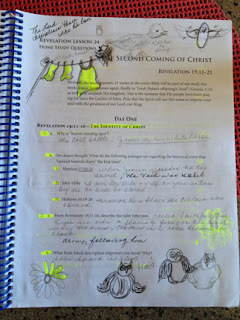 As I just said, I love drawing, and I'm always looking for new techniques and after previewing this class on Christy Tomlinson and Junelle Jacobson's blogs I knew I had to sign up. This class is going to be so much fun. After watching a preview on Junelle's blog, I sketched this quick picture of some sheep. She said to have fun and use your imagination. The one at the top and the bottom were samples she showed, but the one standing, well, it's my own and I called it vulnerable as this skinny little lamb has it's wool in a pile beside it! Now that's vulnerable! I especially like it's shoes! I used the S-T divider in my new password directory. I knew those blank pages would come in handy for sketching. 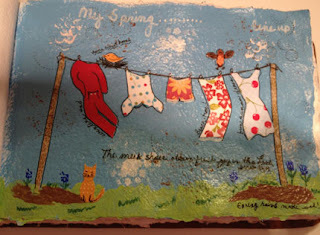 I think everyone should cheek out this class and you can find it on Christy's blog - This class is called The Art of Wild Abandonment and you can find out all the info. by clicking here. Plus you'll find information on lots of other fun online classes. And now when you thought it couldn't get any better, I have to tell you that if you like sheep you will love the pictures on Junelle's blog. 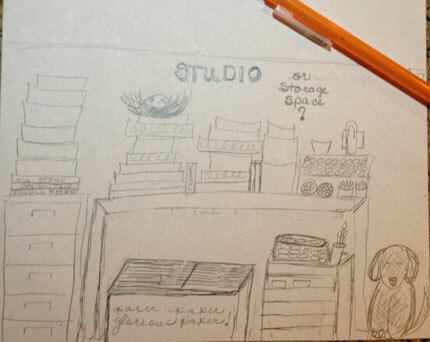 Whether you want to learn to sketch or not, check out this blog, the pictures will win your heart. 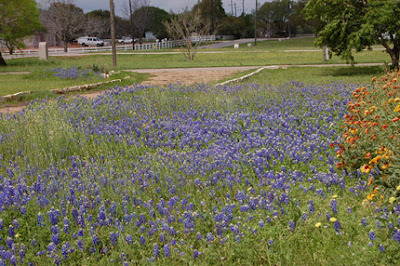 And now for Spring in Texas - this picture is my front yard filled with bluebonnets and blanket flowers. It's so exciting to drive through the neighborhood as the wildflowers are now appearing everywhere. For a week or so mine were the only ones in view, but no longer. This last rain has brought color out everywhere and it looks like this will be a great year for wildflower lovers. After last year it's very welcome. We're getting ready to fence our yard, across the front and down both sides. See the white fence on the upper left top of this picture, well, that's what our yard will look like in a few weeks. I'm so excited and hope that it will lead to the eventual cross fencing in the back that will allow us to add a couple of alpacas in the near future. We went to the livestock show yesterday to see them, but we were so excited that we got there a day early! So, we will head down again early Saturday morning and try to get some information as to just what we would need to build for their protection and all the other alpaca information. I was on the very first llama committee at the rodeo nearly 15 years ago and thought that's what we would want if we ever lived in the country, but their little cousins have won my heart and with a daughter that loves to knit the wool will be a real treasure for her. So probably my next exciting post will be an alpaca picture or two. With all of my comments about sheep today you would think I would be wanting sheep, but although we're in the country, we're in a community and we just got Deed Restrictions to allow llamas, alpacas, cattle and hens. Sheep and goats can only be raised for FFA projects and well, that just doesn't fit our family of two adults and a dog! So alpacas are our "farm" animal of choice! So until later - check out my new online friends and come back to follow my escapades with my new sketching class.